After Kirsty’s interview with Chris Maybin (if you haven’t done so already, read it here). We review The Lost Blend. Bottled in August 2014 to a limited edition of 12,018, created with three different labels, all designed around the same theme: lost items. Single malt whisky distilled at the Clynelish distillery and a small cache of extraordinary whisky from the Allt-A-Bhainne distillery, aged in American oak barrels and just a few years shy of two decades old, combined with malt whisky distilled at the Caol Ila distillery. Bottled at 46% and NCF and natural colour and available here for a cost of £78.95. The name was inspired by The Lost Blend by O. Henry, 1907. This sharp and witty portrait of life in a New York bar was published in 1907 and features two business partners who try to recreated a blend of different spirits with close to supernatural properties. In 2001 Compass Box created their first single malt blend, an elegantly complex whisky which they called Eleutrea. Alas, after three years, we were suddenly no longer able to obtain one of the key whiskies required for the recipe so, sadly, we retired Eleuthera in 2004. Having quietly been trying to replicate this blend since then, with little success, until now John Glaser has had a name he was waiting to use for a whisky such as this. 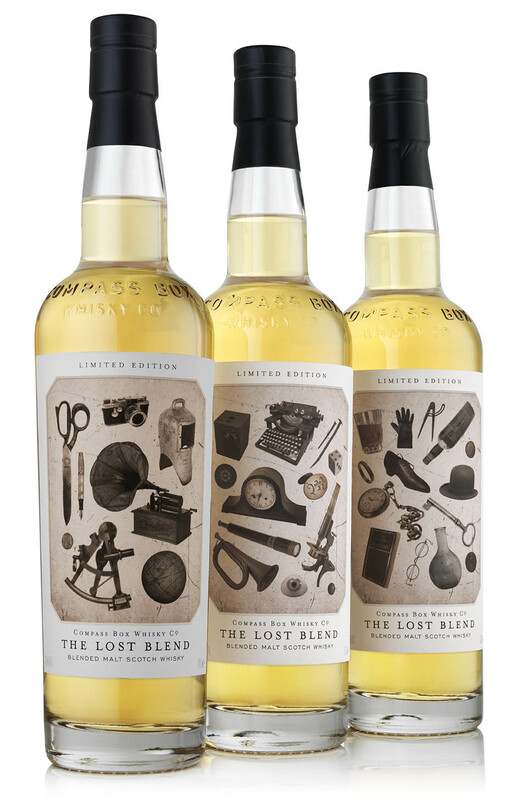 Compass Box is always an interesting creature, innovative and never compromising on ingredients in search of the perfect blend, whether 5 years old or 20 years old, if it makes and amazing product then they will use it. The design is quirky, much like the story behind it, if nothing else this will be interesting. A lovely sticky honey note, quickly followed up with a little lemon and a touch of Satsuma, the honey notes really keep this from becoming too tart and calms the citrus fruits down into boiled, travel sweets. Touches of peach enrobed in soft cream. There is some soft red apple and lots of pear, not acetone, just soft, grainy, sandy, fresh pear, and a lovely vanilla sweetness, you can’t help but think of a crème brulee. Lost in the background (see what I did there?) is some very gentle peat, if you weren’t a peat freak you may not find it, but for me it’s there, encircling the pears and the vanilla. There are some very light heather notes in there too and just a touch of rosehip, but it’s the fruits and the creamy sweetness that take over the nose. Warmer on the palate than I expected, there are some cloves and a little black pepper which are the first notes you pick up. There’s some white pepper and here is the smoke, it stays at the very back of your throat and just kisses the roof of your mouth, before the sweet malted cheesecake base takes over, all digestives, rich melted butter and sweet honey. This sweetness continues, with the heat still making itself known along with the cloves comes cinnamon and some nutmeg, and lashings of good quality custard. There are still some fruit notes to be found but they are as gentle on the palate as they were on the nose, the apples are baked, the pears rolled in vanilla sugar, and the citrus still calm and soothing. It’s hard to be sure exactly what note is the last to leave, is it the sweetness? Or is it the smoke, which actually never really left, but stayed unassumingly in the background, and still does. Soft and sweet, slightly drying as it nears its conclusion. The peat continues to pinch at the roof of your mouth along with the spices, and there is a touch of orchard fruits which are intertwined with the rich butterscotch notes. A lovely gentle blend, at first you could mistake this for being rather unassuming but as soon as you taste it, the fire in its belly makes you take notice. It’s got orchard fruits, baking spices, pepper heat and some wonderful, yet delicate smoke. There’s the gentle maltiness that you would expect and a sweetness that is really show stopping. John knows his stuff, there is no doubt and this was well worth the years he has spent searching for just the “right” ingredients. Is it supernatural? Not quite, but am I glad it’s not lost anymore? Definitely, and I think you may well be too. Chocolate banana sweets to start, followed quickly by Peach Melba yogurt, fruity and creamy. There is a slight hint of smoke, more sooty than from a roaring fire. There’s a touch of lemon which draws you in to taste. Bursts of lemon drops explode in the mouth, along with pockets of smoke. A beautiful creamy texture, with soft citrus fruits. The smoke softens right down to almost undetectable levels but not quite. More lemon appears and this time it is joined with honey and heather. Sharp, citrusy with a subtle smokiness, very subtle. An interesting dram, I like what John is trying to do in trying to bring back his first ever Compass Box creation, this isn’t a million miles away but feels more mature, whether that is to do with the whisky or the creator I am unsure. I am a massive Compass Box fan and this is a wonderful addition to the range, however this isn’t in my top three. One for the uninitiated, as it’s a gentle introduction to Compass Box.